Sam Boyd Stadium, Las Vegas, Nevada. The annual Monster Energy Cup motorcycle race. One million dollars. The Joker Lane. 3 Main Events. An elevated start area. Ryan Dungey, Ken Roczen, James Stewart, Justin Barcia, Trey Canard, Chad Reed, Davi Millsaps. 3 main events. If a rider wins all three main events, he will pocket the 1 million dollars. You’ll see a photo of Ryan Villopoto. He did not race, just rode in practice and opening ceremonies. Trey Canard quickest in Qualifying – 1 minute 7.76 seconds. Broc Tickle 1:07:93, Christophe Pourcel 1:07:96, Ken Roczen 1:08:01, Jason Anderson 1:08:09, James Stewart 1:08:15, Blake Baggett 1:08:30, Zach Osborne, Dean Wilson, Chad Reed, Justin Barcia, Vince Friese, Ryan Dungey 1:08:89. 37 riders attempting to qualify. 3 Main Events, ten laps each. Main Event 1 – Trey Canard leads Ken Roczen and Ryan Dungey on lap 1. Trey Canard then falls over in the wide banked right hand corner near the start. A few moments later, as Trey is on the ground, James Stewart falls into Trey. Ken Roczen leads Ryan Dungey on lap 2. Trey Canard is 19th, and James Stewart is 21st. A bit of confusion towards the end of the race. Ken Roczen is leading, and takes the Joker Lane. Jason Anderson then moves into first. Jason Anderson takes the checkered flag, but he did not take the Joker Lane – it must be taken at least once per race. Ken Roczen is declared the winner. Main Event 2 – Justin Barcia is the early leader. James Stewart did not start this race. End of lap 3 Jason Anderson leading, Justin Barcia 2nd, Davi Millsaps, Ken Roczen, Ryan Dungey, Trey Canard, Dean Wilson. Jason Anderson on Husqvarna wins Main Event 2. Trey Canard, Justin Barcia, Ken Roczen, Ryan Dungey top five. Going into Main Event 3, Ken Roczen leads – he has scored a first and fourth for 5 points. Jason Anderson was penalized down to sixth position in race 1. He has a sixth and first for 7 points. Ryan Dungey also has 7 points, by finishing second in race 1, and fifth in race 2. 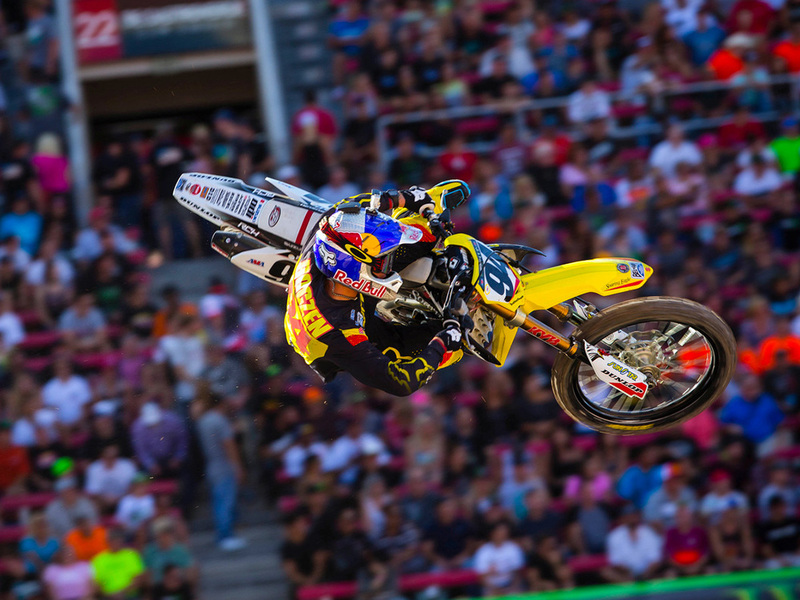 Main Event 3 – Ken Roczen wins the race, and the overall victory. Ryan Dungey finishes second, and gets second overall, with Jason Anderson third, and third overall.